Some people feel for one reason or another that they will remain with their abusive partner, parent or other family member. Despite overwhelming advice that leaving an abusive personality is the best thing one can possibly do for oneself in order to enjoy a normal peaceful life, some find that they cannot walk away. I have been in touch with so many people over the years who have stayed with an abusive partner for maybe thirty or forty years, clinging to the hope that somehow this person will change for the better. Their hopes and dreams were shattered when time revealed there was no improvement in behaviour. Sadly the only changes they witnessed were that the behaviour got considerably worse as they aged. The best advice that I could give anyone is to create as much distance as you can between you and a toxic individual. Do not engage with them on any level. 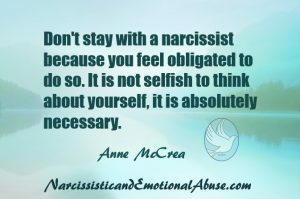 Don’t stay with a narcissist because you feel obligated to do so. It is not selfish to think about yourself, it is absolutely necessary. For those brave souls who wish to remain in close proximity with a narcissistic personality be prepared for the challenges that you will inevitably face as you share your life with these individuals. Keep your expectations low and be prepared for a rough ride. By all means, set your boundaries but rest assured, the narcissist will disregard them and cross those lines time and time again. Give up the idea of living your life on your terms. Familiarise yourself with the term, ‘double standards’. There will be a set of standards you will be expected to live by. However, these standards will not apply to them. 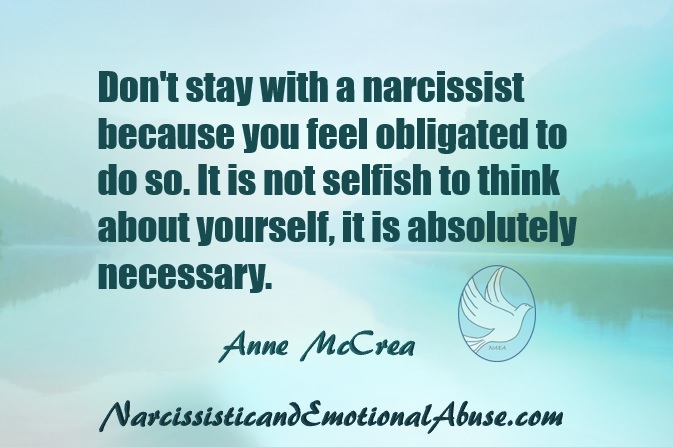 You will be expected to live your life as the narcissist sees fit and abide by their rules. You will lose your individuality as you strive to achieve the impossible… i.e. making them happy. As most of us know, we are responsible for our own happiness. We cannot rely on others to do that for us. However, a narcissist doesn’t see things that way. They need your endless attention and admiration so that they can feel some semblance of contentment for short periods of time. The narcissist will get bored relatively quickly and you will find that you are not doing enough to ensure that these snippets of contentment last for long. Invest in thick soled shoes or boots to protect your feet from sharp edges as you constantly walk on eggshells, tip toeing round this person so you don’t upset them with a casual glance, remark or dare I say, disagreement. Lose yourself as you serve your master or mistress. Your friends will disappear as after all, you cannot be loyal to two masters so they’re not really going to have a place in your life any more. No doubt, you’ll be told what bad people they are so you’re really much better off without them. Your isolation will ensure that you have no one to turn to when you need a shoulder to cry on. Let go of any idea that your thoughts, needs and wishes will be respected. Your emotional well-being is not of their concern. They will never feel your pain as you struggle to make sense of the hurt they cause you as a result of their cruel words and actions. You are more than likely just being too sensitive. Grow accustomed to their anger and absorb their rage and expect to bear the brunt of these uncontrollable episodes. Learn to forgive them their misdemeanours over and over again but don’t expect them to forgive yours. As your life slips by, try not to dwell on the past, on the ‘what ifs’ or the ‘ could have beens’. Try not to think of how much better life would have been if you had walked away all those years ago. It was your decision to stay with someone who will never appreciate the sacrifices you made for them. Oh my gosh, does this hit home! I split with N over a year ago, he’s non stop messages almost every day, some horrible words and threats. Now has changed attitude and starting to be nicer. I guess he’s thinking is ‘il be nice then she’ll take me back.’ I even think about it sometimes, like maybe he DOES want to do the right thing now, and that he respects me. How do they mess with our heads so bad that we’d believe anything without any REAL effort and understanding.